My friend Jeremy is back for another guest post. This time he addresses a classic that he finally pulled down off the shelf. He didn't know I was writing up a post on Classics I Mean to Get To when he wrote up his post and so the timing of it was rather amusing. Anyway, if you can sympathize with this situation, I dare you to read this post. I can't imagine that I'm the only who has classics sitting on the shelf that I've been meaning to read for years, but just never actually picked up when the time comes to pick a book to read. My eyes tend to slide right past books like War and Peace and alight instead on the newest John C. Wright space opera. I like having War and Peace on the shelf, I feel good about it, but it’s low odds I’ll actually read it of my own free will. Of course, I may be more easily distracted than most (I once spent 6 months exclusively reading books off of Jimmy Buffet's personal Top 10 list) but I'm sure most of you know what I'm talking about. Sometimes, however, I overcome the urge to read Clive Cussler's latest formula book and pull out something that I figure will be a bit slow, but will have a chance of giving me another box to check off on those '100 Best Books Ever' lists that always pop up on the internet and in magazines these days. Which is really hard to do, by the way, because none of the lists is ever consistent. The only thing you can guarantee is that they'll all have A Tale of Two Cities and a pop-religion book by either Mitch Albom or Yann Martel, but not both, and some book that nobody heard of but the editor writing the list to make him/her look smart. There's probably close to 1,000 books in the 'Best 100' pool and so it's hit and miss whether you're making progress at all by reading a given book, and the only thing you can be certain of is that you need to totally disregard any list that includes Gravity's Rainbow because that clearly means the editor didn't read all the books on the list. 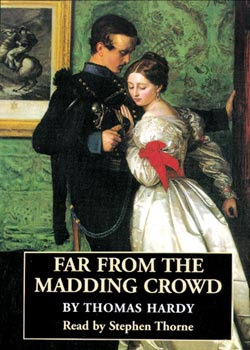 So anyway, I recently read Far from the Madding Crowd by Thomas Hardy. It was an interesting experience because as I was reading, I never once thought 'Wow, this is incredible and memorable!' but it's stuck in my mind in a way that a Cussler plot never has, despite the fact that I've read his plot 15 times in his various books. The plot centers around the English countryside in pre-industrial revolution days and Gabriel Oak, the steady, simple, stalwart and good-hearted shepherd who falls for the headstrong and independent Bathsheba Everdene. In the beginning, Gabriel has the financial upper hand as an independent shepherd to her penniless state, but Bathsheba rejects his initial advances, and tells him it can never be in a fit of emotion. The wheel of fate, however, continues to turn and a tragic accident reduces Gabriel to a hired worker, while Bathsheba inherits a prosperous farm. Thus begins a period of years where Gabriel works on the farm for Bathsheba and has to watch as she blunders her way through awkward and damaging romances with the swaggering, spendthrift and philandering Sergeant Troy and the intense, myopic and obsessive Farmer Boldwood. Much of the book paints these scenes against the background of a deeply satisfying picture of English farm life. The folk of the countryside are a motley but human group, and the community feel and rhythm of planting, reaping, shearing sheep and fighting the elements paints a picture as old as humans and human nature. It's a place you might like to live a while to forget your cares and worries, knowing that hard work equals reward and the only schedule you have to keep is the schedule of the seasons. Although the book contains quite a bit of tragedy, and shows some of Hardy's dislike and animosity toward mis-matched marriages, it is much more happy, overall, than his later works. This was his first successful commercial publication, and was originally written under a pen name, thought to be an alias of George Elliot, and garnered immediate accolades. The startling concluding scenes contain some nice twists, and the book ends on a happy note for some characters and tragedy for others. A theme throughout the book is the understated compatibility of ideas between Bathsheba and Gabriel, that perhaps even they don’t see, regarding how life should be, how the farm and estate should be run, and how people should be treated. This ties in to Hardy’s viewpoint (which grew over the years, rather than receded) that women are easily swayed by fine words and promises and fail to see deeper into the character of a man. There is a lot of speculation that Hardy’s own tempestuous first marriage influenced his views on marriage in his novels, but this book lacks the bitter tinge of his later works. Hardy also uses bits of ironic fact and coincidences in this book: momentary urges and missing appointments play a major part of the story, although you can argue that such happenstances are always consistent with the attributes of the characters, and while they provide branching points and crossroads in the story, it is never with an unjust result. You get the feeling like Hardy would love to have been fatalist in his writing, but just wasn’t able to do it in the end. If you're looking for a classic to read, and want something with themes and characters that will stay with you (and don't want to feel depressed from reading Tolstoy or Dostoevsky) I recommend this book. You won't notice the 'fantastic writing' as you're reading, like you might with Hemingway, but every character you ever liked won't die and you won't be left wishing you'd read 'Inca Gold VIII’ instead. I bet you’ll remember the plot and the points years after other books have faded from your memory. And that makes it a classic. Jeremy is an attorney in Bakersfied, CA who is a good ol' friend of mine from law school. He has recently discovered book blogging to be an amusing past time and I'm glad he does. Wave a happy hello to him, if you like! Your reviews fit right in with Carrie's! Thanks for sharing! This is another title I've known of for years without knowing what the book was about. Thanks for the info! Great review! This is one of my favorite books, and as you mentioned, actually pretty upbeat for Hardy. Annette, thanks, glad you enjoyed the review! I appreciate Carrie allowing me space on her blog, but I don't think I could ever write enough to start my own...so I think I'll just continue to enjoy her graciousness until she gets sick of me. ;) Thanks everyone for the encouraging comments. Thank you for letting me know this was one of Hardy's less bitter novels. I love his writing, but hate depressing books. Very nice review! I read a few Hardy books many years ago and really enjoyed them. Some are still on my shelf. But it's been so long, I don't remember any of the details. I keep thinking that I should reread at least one, just to see if I still like Hardy, but I have so much else to read. Your review has reminded me that I do want to pick those books back up again. Yeah! Congrats! I read this one last year along with the ladies in my book club. Everyone enjoyed it. It's one of the few good Hardy reads. Some of his were pretty depressing. This one is definitely a must read. Glad you enjoyed it. Haha! I misread and thought Carrie had read this... when it was actually Jeremy. Sorry about that mistake. But my sentiments stand and now I say.. Carrie should read the book too! Great review. I have a blog friend who always recommends Hardy; beyond reading Tess in high school I haven't yet had the pleasure. You may have convinced me to take the plunge!